The coloured Boomwhacker tubes are an incredibly simple yet effective instrument (basically a coloured plastic tube). Very simple rhythms are combined in a particular way to create a tune which (ironically) becomes rich and complex. There is a sense of group standard set, because everyone can feel the common pulse which pulls all the parts together - everyone knows what to follow and everyone knows what's expected of them. There is a strong sense of group connection that takes place in the activity. It doesn't matter whether you are playing on a table right at the very back of the room - table number 1 still feels connected to table number 33! Leverage? - well I guess this is the moment when an entire group of delegates can hear what they have achieved. Initially, as each team concentrates on playing their part competently, it might be hard to hear the entire musical sound and the way one's part contributes to the whole. But as everyone becomes more relaxed and competent, the realisation kicks in that-''actually, this is starting to sound really good''! Everyone can hear the complete sound with all the combined parts playing in musical synergy. In a nutshell - it's the sound of team success! 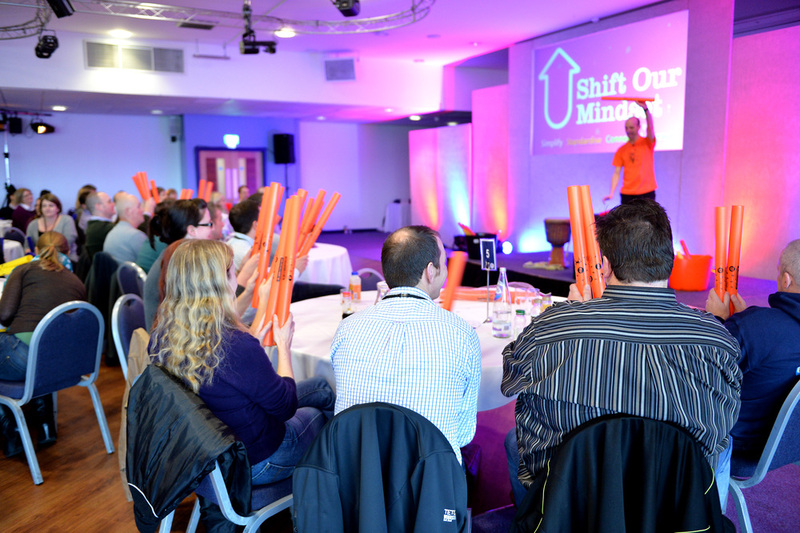 "The Boomwhacker Energiser was a tremendous success at our recent PepsiCo UK Operations Conference. Not only did it create high levels of fun, energy and team spirit in the room, it reinforced our theme of Simplify, Standardise, Connect and Leverage in a very memorable and engaging way." And a very big thank you to Arran Mitchell from Sunburst Events for allowing us to use these photographs from the event.